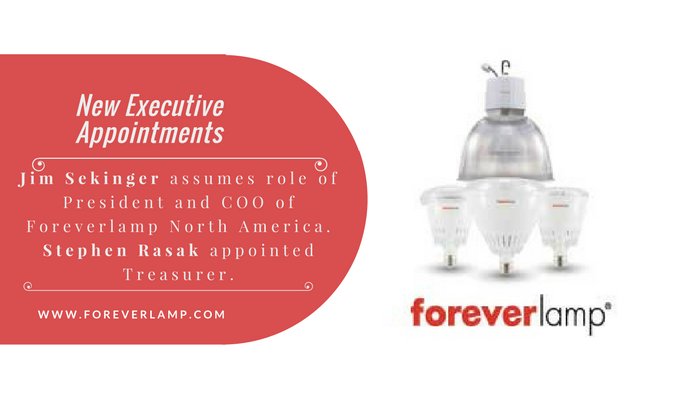 New President and Executive Officer Appointments Announced by Foreverlamp, Inc.
Jim Sekinger assumes role of President and COO of Foreverlamp North America. Foreverlamp, Inc., a privately held company founded by Peter S. Shen, former president of Philips Lighting and Electronics Group, today announced a new President and a slate of Executive officers. The changes are designed to allow the company’s leadership team to maximize time and attention to focus on seizing additional new growth opportunities and initiatives for LED lighting. Foreverlamp, the Big Lumen Lighting Company™, specializes in Big Lumen™ plug-n-play technology and products that are designed to specifically replace HID high bay lighting. Founded in 2010 by Peter S. Shen, former president of Philips Lighting and Electronics Group, Foreverlamp is headquartered in Torrance, CA. with regional offices in Beijing, Taipei and Tokyo. Foreverlamp has quickly become a leader in the LED retrofit and high-bay luminaire market and is the first lighting company to offer a plug and play lamp options of 17,000 through 28,500 lumens as a replacement for a 400w metal halide or high pressure sodium HID bulbs and the first company to offer a 45,000 and 52,000 lumen LED lamps as a replacement for 1000W metal halide. No re-wiring or ballast by-pass is required.